Last week the Evening Standard covered the "increasingly bitter and personal" election battle for the highly marginal seat of Richmond Park in south London. Front-runners to be Richmond's MP are Conservative challenger Zac Goldsmith and the former Liberal Democrat MP for the area Susan Kramer, defending a majority of just 3,731 votes. Zac levels the accusation in the piece that "Kramer has told the most appalling lies about me and is intent on misrepresenting my position on almost every issue." But more interesting was his claim against his Lib Dem opponent that "one of her activists even tried to infiltrate my campaign by applying for a job as a data-entry clerk. He gave his name as John O'Grady, but he was really Dan Falchikov, a Lib Dem activist." Confronted with the allegation, Ms Kramer doesn't dispute it, merely agreeing that what Mr Falchikov did was "unacceptable" but claiming that "It has nothing to do with me. Falchikov is not part of my campaign team and he never was." But that just doesn't add up, as this isn't the first time we've heard of this Lib Dem activist up to tricks in Ms Kramer's neck of the woods. Falchikov last surfaced boating loudly on a train that he had "got Evening Standard to claim Lab has secret plans to shut Kingston Hospital" - a scare campaign that Susan Kramer has made a key plank of her re-election bid. Unfortunately for him, Falchikov's boasts were overheard by the Daily Mirror journalist Kevin Maguire, who also reported via Twitter, "Train bloke now boasting the hospital scare story cooked up at his kitchen table." Falchikov was later identified after Maguire took his photo and posted it on online. Would Susan Kramer seriously have us believe that Falchikov is a rogue Lib Dem activist who just happens to busy himself spinning false claims about a subject Ms Kramer has made a lead issue in her election campaign, and attempting dirty tricks against her main rival, yet has nothing to do with her campaign? In the absence of greater reassurance being provided by Ms Kramer that she has no connections with Falchikov, the weight of evidence to the contrary is starting to speak for itself. Reinforcing the reports we aim to draw attention to here on this site, Peter Oborne had an article in the Daily Mail last week exposing more examples of Lib Dem dirty campaigning tactics. Headlined 'Dirty tricks of the REAL nasty party', Oborne set out why he has concluded that Nick Clegg’s effort to portray the Liberal Democrats as the honest and decent party is a "cynical" claim. - the nasty attempted character assassination of a local Tory MP, Nadine Dorries, by the Lib Dem candidate for Mid Bedfordshire, Linda Jack. While we wouldn't agree with Peter Oborne when he says "None of this deceit mattered too much when the Liberal Democrats were a minor party on the fringes of Westminster", the party's recent rise in the polls does make it all the more important that people realise what kind of people, and what kind of party, they may be considering giving greater influence over how this country is governed. Lib Dem MPs in South London have been accused of whipping up a scare story of cuts at their local hospital in order to further their chances of re-election. The emotively-titled "Save Kingston Hospital" campaign, launched by Lib Dem MPs Susan Kramer (Richmond upon Thames) and Ed Davey (Kingston & Surbiton), has been provoked by a review of local NHS services. The strategic plan, being drawn up South West London NHS, floats a wide range of options for services at hospitals across a broad region of South London from Twickenham to Croydon, discussion of which is set to continue for most of 2010. Crucially, while the review discusses changes to the provision of health services across the district, there is no suggestion that Kingston hospital faces closure, nor any confirmed plan to reduce services at Kingston hospital specifically. Having received several briefings from local NHS chiefs about the review, it was only after being told that discussion of the plan would continue until well past a likely May general election that the Lib Dem MPs launched their campaign to 'save' Kingston hospital and published parts of the confidential NHS document. In order to calm local fears being whipped up by the Lib Dems, the chief executive of Kingston hospital was forced to issue a statement denying closure plans. In an open letter, Kate Grimes said: "There are no specific plans for change at Kingston Hospital and if any proposals for change to hospitals across South West London are made, I think we at Kingston are in a strong position." In a debate in Parliament on the subject yesterday, the Lib Dem MPs involved - Susan Kramer and Ed Davey - were accused by both Conservative MPs and a Labour minister of "scaremongering" and "playing politics" with the NHS. Responding to the Lib Dem claims, health minister Mike O'Brien said "here we have the cynical winding up of the electorate" and added "the Liberal Democrats have a record of running scare stories and asking people to join the campaign by sending in their addresses, petitions and email addresses. They can then canvas those people - it is all about elections." Conservative MP Mike Penning joined the criticism, asking Mr O'Brien, "Does the Minister agree that it would have been very easy for other political parties, not least my own, to jump on the Liberal Democrats' bandwagon of scaremongering? As he knows, I have campaigned against Labour cuts on many occasions, but when there has been proper information and documentation." In a further blow to the credibility of the Lib Dem campaign, Mr O'Brien read out a series of Twitter postings by Daily Mirror journalist Kevin Maguire, in which Maguire relates overhearing on a train a man boasting that he had "got Evening Standard to claim Lab has secret plans to shut Kingston Hospital." A second Twitter update from Maguire says "Train bloke now boasting the hospital scare story cooked up at his kitchen table. Very proud of Facebook following". Having posted his photograph, the man who was apparently so proud of having 'cooked up' a regional NHS review into 'secret Labour plans' to shut a hospital was later identified by Maguire as Lib Dem activist Dan Falchikov. Aptly summarising the situation, health minister Mike O'Brien concluded the debate in Parliament by saying: "What they are doing, however, is trying to frighten people into believing that services are definitely closing, when all that is going on is some discussions between clinicians. What the eventual proposals will be I do not know, and nor does he [Ed Davey]. We should not at this stage use scare stories like this for election purposes, in a cynical way." Lib Dems in Camden have been caught out sending out contradictory messages to appeal to different communities within the same borough. Alongside a picture of herself with Muslim community leaders, Jo Shaw - Lib Dem parliamentary candidate for Holborn & St Pancras - makes clear in a local leaflet distributed to Muslim areas within her constituency that she is calling on the government to "stop arming Israel". On her website, she reports how she joined a march against last year's Israeli "attacks" on Gaza and comments "Gordon Brown and the Labour Government have acted much too slowly in condemning Israel." 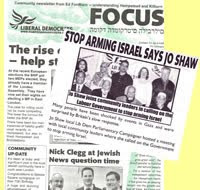 Shaw is following official Lib Dem policy (pdf), which takes a robust line against Israel, calling for the suspension of British arms sales to the country, the suspension of new EU-Israel trade agreements, an end to the economic blockade of Gaza and an end to settlements. All fairly straightforward, until you travel a mile or so up the road to the Hampstead end of the borough. Here, such themes can be said to be far from evident in the leaflets - complete with Hebrew text - distributed in the Jewish community of the Hampstead & Kilburn constituency by the campaign of fellow Lib Dem parliamentary candidate Ed Fordham. A Lib Dem parliamentary candidate who posted a series of lewd and personal attacks on a political website has been forced to resign. Greg Stone, the party's candidate for the Newcastle East parliamentary constituency, made the comments on the Guido Fawkes political blog under the pseudonym 'Inamicus'. Among numerous offensive comments about government ministers and MPs, Stone described foreign secretary David Miliband as looking "monged" and suggested that Hazel Blears was 'on Botox'. Women MPs were singled out for particularly harsh treatment, with Anne McIntosh - against whom Mr Stone stood in 2001 - Theresa May and Theresa Villiers all coming under fire for their dress sense. Others targeted were Labour MPs Sharon Hodgson, who was described as the "thickest MP in the House" and Roberta Blackman-Woods who was called a "sour-faced b****". The Daily Telegraph comments that the episode is particularly embarrassing for Lib Dem leader Nick Clegg, since he and most of the Lib Dem shadow cabinet have backed Mr Stone by visiting his Newcastle campaign in the past year. Mr Stone also claimed on numerous occasions to be an adviser to the Lib Dem leadership. Despite his resignation as a parliamentary candidate, Newcastle newspaper The Journal writes that Mr Stone still intends to stand for re-election to Newcastle City Council in May. Liverpool Lib Dems have been caught out propagating completely unfounded allegations about the views of their Green Party rivals over a local regeneration project. An edition of the Lib Dem's local Focus newsletter about the restoration of a landmark gardens site alleged that Green councillors "called for the plans to be scrapped" and instead "want to build a completely undeliverable eco-village". As ever, no quote or reference is given by the Lib Dems to back up their claims. 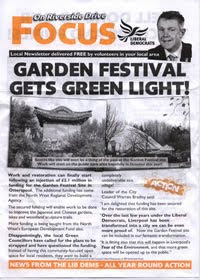 Responding to the smear, Liverpool Greens said that the claims were "completely untrue" and that their councillors were "baffled" as to where the Lib Dems' accusations had come from, publishing their own briefing about the restoration project alongside the offending Focus newsletter. But compared to previous Lib Dem antics in Liverpool, the Greens could be considered to have got off lightly. Back in 2008, a leading Lib Dem councillor in the city was caught distributing leaflets purportedly published by another party smearing a local Labour rival and her husband. According to the Liverpool Echo, Cllr Steve Hurst delivered pink leaflets supposedly from the United Socialist Party (TUSP) claiming Labour Cllr Pauline Walton left meetings early "to go lap dancing" and her fireman husband Keith was a "scab" during firefighters' strikes. The court heard that Hurst, wearing dark glasses and a baseball cap, had been accosted while delivering the leaflets by Mr Walton and his two sons, whereupon a scuffle ensued and Hurst fled, dropping not just some yellow and pink Liberal Democrat leaflets but also the pink supposed TUSP flyers. On sentencing Cllr Hurst, Judge Richard Clancy said that he thought Hurst's "motives were misconceived". Hurst was found guilty of breaching election law requiring the source of political information to printed on campaign materials and was fined £500. According to the Liverpool Daily Post, Cllr Hurst also lost a later appeal against the verdict, at which hearing the judge condemned his activities as "dirty tactics of the worst kind" and said that "This sort of conduct brings considerable discredit on his party and local politicians in general." When it comes to highly personal attacks against their political opponents, local Lib Dems clearly take their lead from the very top. Back in September, it was revealed that the senior Liberal Democrat MP and former leadership contender Chris Huhne had been planning a "Nazi slur" against Conservative foreign affairs spokesman William Hague. According to the Evening Standard, in his keynote speech to his party's annual conference, Mr Huhne was intending to brand Mr Hague a "skinhead who has toured the beer cellars of central Europe". 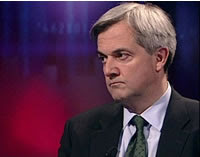 The startling attack was shown in a draft copy of his address, but at the last minute Huhne scrapped it from his speech. The omitted sentence from his draft said: "Skinhead Hague has toured the beer cellars of central Europe, and has come up with the dregs." At the simplest level, calling a bald man a skinhead is crass and unfair. But in invoking that far-right imagery and in referring to the known preferred venues for Adolf Hitler's political meetings, Mr Huhne's more sinister attempted analogy was clear. When Nick Clegg's chief-of-staff, fellow MP Danny Alexander, was quizzed on the missing "skinhead" line, he admitted: "There was a line in an early draft and I think he decided that the substance of that was important, not getting into a discussion on William Hague's hairstyle or drinking habits." However, this wasn't the first time Chris Huhne has found himself in trouble over the propagation of personal smears against his political opponents. During the 2007 Lib Dem leadership battle to replace Sir Menzies Campbell, a document circulated by Huhne's campaign was revealed to have labelled his chief rival, Nick Clegg, "Calamity Clegg". The document set out a series of quotations aimed at showing Mr Clegg's policy "flip-flops". Huhne claimed that the document was the work of an "over zealous researcher" but was forced to issue an apology. Lib Dem campaign guide: "be wicked, act shamelessly, stir endlessly"
The underhand tactics evidently often deployed by the Lib Dems at the local level could perhaps best be described by one line from a campaigning guide published by a group representing Lib Dem councillors. The strategy guide titled Effective Opposition, first exposed back in 2002 but remaining available for several years until discontinued, set out clearly the group's attitude to how Lib Dem campaigners should approach local elections. Published by the Association of Liberal Democrat Councillors (ALDC) - an autonomous but official 'Associated Organisation' of the party - the handbook's most controversial recommendation was to: "be wicked, act shamelessly, stir endlessly". However it also advises candidates to "exaggerate" claims and to use a range of other negative campaigning tactics. As a blog posting on The Guardian's website reminded us more recently, on page 23 the handbook advises candidates "Don't be afraid to exaggerate" and on page 4 "Positive campaigning will NOT be enough to win control of the council." On page 6 the handbook encourages duplicity, saying "you can secure support from voters who normally vote Tory by being effectively anti-Labour and similarly in a Tory area secure Labour votes by being anti-Tory." We're finding evidence of all these tactics being employed in the Lib Dems' local campaigning. What this publication shows is that the incidents we're uncovering can't just be dismissed as the ill-judged actions of the occasional 'bad apple', but are instead symptomatic of broader, rotten attitudes to democracy. A Lib Dem councillor in Sussex has been forced to apologise for misleading voters during last year's county council elections, according to the Bognor Regis Observer. Bersted councillor Simon McDougall distributed a leaflet accusing the Conservative-run district council of favouring the building of houses on a local farmland site. In fact, the site was one of three possible options for future development in the area being considered by the council and the final decision had yet to be taken. Cllr McDougall narrowly retained his seat with 992 votes ahead of the 873 for his main rival, Conservative Ann Smee, and is now the Lib Dem candidate for Bognor Regis & Littlehampton at the next general election. In a statement before the council, Mr McDougall said: "I apologise unreservedly to the council and the Conservative group for making a statement that was incorrect." "I realise there were legal implications for the council because of the statement which I made and I am quite happy to correct it." Cllr McDougall agreed to fund local newspaper adverts withdrawing his statement and a letter to 340 households who received the original leaflet. The activities of the Lib Dems in Norwich North are far from the only example of dirty tactics being employed by the party during a by-election battle. Lib Dems have a long history in particular of launching personal smear campaigns against rival candidates, rather than focussing on their own policies and ideas. The 2006 Bromley & Chislehurst by-election was a classic case not just of underhand tactics but also of dirty politics. The Lib Dem bid to win the seat started rather shamefully when the party's then leader, Menzies Campbell, had to intervene to "put a stop" to local activists campaigning before the funeral of the former local Conservative MP - Eric Forth - had taken place. Once the by-election campaign was underway, the party's tactics didn't get much better when a series of leaflets issued by the Lib Dems appeared designed to mimic Labour and Conservative party literature, a general interest magazine and not one but two styles of local newspaper. But it was the so-called 'Bromley Mail' Lib Dem leaflet (pictured above) that set the scene for one of the Lib Dem candidate's key themes of the by-election - a front page splash not setting out his main policies, but a highly personal attack on this chief rival. 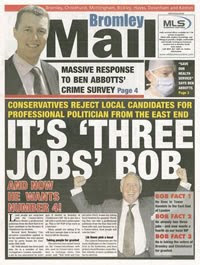 Castigated with the nickname "three jobs Bob", Conservative candidate - now MP - Bob Neill was criticised for being a member of the Greater London Assembly (GLA), sitting on a health authority board and working as a barrister. But beyond the dramatic headline, repeated by the Lib Dems in leaflet after leaflet, the essence of the attack was misleading as none of the jobs were full-time and Neill's work with the health authority was shortly to end as the authority would soon be abolished. Criticising Neill for being a barrister was particularly short-sighted, as another Conservative MP, Ed Vaizey, pointed out at the time in a Guardian article headlined "unedifying attacks". Neill would hardly be the only barrister in Parliament, among not least one MP who at the time listed "occasional practice as Queen's Counsel" in his register of member's interests - then Lib Dem leader, Menzies Campbell. The 'Bromley Mail' Lib Dem leaflet further misleads by quoting comments made on a website purportedly "used by Conservative members to exchange views", clearly seeking to portray that the party's own activists were upset with the choice of Bob Neill as their candidate. Neglecting to point out that anyone can post comments on the ConservativeHome site - not just Conservative "members" but also, potentially, supporters of other parties. Making over-hyped personal attacks on rival candidates, leaving out critical information that diminishes claims being made and publishing campaign material that appears to be designed to imitate independent or another party's literature are the sort of tactics it's time the Lib Dems left behind. The Lib Dem candidate in last year's Norwich North by-election came under fire from even her own side for a campaign leaflet that accused her Green Party rival of holding "extreme views" on the 7th July terrorist attacks. As seems to be the form in such examples of Lib Dem mud-slinging, no direct quote was given and comments denouncing the Green candidate, local councillor Dr Rupert Read, are ascribed to the nameless pair "one local person" and "another Norwich resident". So far, so dirty. Even more so when you take into account Dr Read's response, in which he calls such depictions of his views "both baseless and (in a number of cases) libelous" and condemns "any terrorist attacks on civilians" - together with defending himself against a range of other smear attempts. Sadly this experience of Lib Dem tactics in Norwich North was probably all too familiar for Dr Read, who wrote an article titled "Those FibDems" exposing false claims made by the Liberal Democrats about the Green Party's chances during the earlier European parliament elections. According to Dr Read, the main Lib Dem election leaflet delivered to all households across the Eastern regional euro-constituency set about "systematically misrepresenting the facts about the electoral arithmetic". 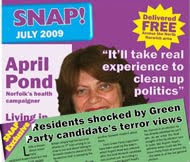 The leaflet included statements like "The Green Party has no chance of electing a European MP for the East of England", inappropriately basing the view on results in completely different elections. The lie was given to the claim when, in fact, the Greens missed out on a seat by a little over 1% of the vote. Lib Dems in Cornwall were forced to make a formal apology after using a highly offensive obscene term to describe an opposition councillor ahead of last year's county council and Euro elections. The Herald, a campaign leaflet supporting Lib Dem Cornwall Council candidate Anna Pascoe distributed to houses in the Camborne South division called a rival council candidate a "greasy-haired t***". The offensive remarks came to light when the local Lib Dem office received complaints from Camborne residents. The target of the abuse, Camborne Town Council member Stuart Cullimore, said he was "absolutely appalled" at being the subject of foul-mouthed abuse in an official Lib-Dem leaflet. Commenting to The Herald, he said: "It's just unpleasant and nasty. It has been extremely upsetting for me and my family. I don't know who is responsible for this but the Lib-Dems have a responsibility to find out and make it public". The local Lib Dem agent officially responsible for the party's leaflets was unable to offer an explanation for the obscenity and was forced to apologise formally to Cllr Cullimore. The activities of the Lib Dems in one Liverpool ward is something of a case study of the party's brand of local-level negative campaigning, misleading claims and false accusations against their political rivals. Green Party councillors in the city's St Michaels ward have challenged the Liberal Democrats to defend a lurid leaflet that claimed the Greens planned to "force limits on the number of children local families can have". A second smear was headlined "Green councillors make homeless sleep in the snow." In response, the Greens condemned both accusations as "completely unfounded" and launched a legal fund to "fight Lib Dem libel" in a bid to force local Lib Dems to defend or explain their accusations. On population, the party pointed out core Green policy that "PP106 The Green Party holds that the number of children people have should be a matter of free choice." And on the cold weather shelter accusation, in a full explanation of the shelter arrangements the Greens responded "The preposterous idea that "Green councillors refused to allow a local community building to be used" for cold weather shelter is not only untrue - it is impossible. Local councillors do not have that kind of authority." Perhaps demonstrating the Lib Dems' desperation to hold on to their last seat in the ward, the double-smear leaflet was followed by more negative campaigning - this time a 'holiday postcard' claiming Greens wanted to add £100 Air Passenger Duty to "every air ticket". However, the Green Party budget statement (pdf) published a couple of months beforehand in fact suggested a doubling of air passenger duty, which in the case of a standard flight to Spain would be £20 - five times less than the Lib Dem postcard suggested. In a bid to bring a halt to such smears and dirty tactics, local Green councillor John Coyne invited his Lib Dem rival Cllr Peter Allen to attend a public meeting to account for the content of the dirty tricks leaflets. However, Cllr Allen did not turn up. NastyLibDems.org is a resource designed to reveal to the British electorate and media the extent to which the Liberal Democrats engage in dirty tricks and negative campaigning against their political rivals. For too long they have got away with presenting themselves on the national stage as 'whiter than white' - as a political force operating on a morally higher plane than Labour, the Conservatives and the other parties. Yet their actions on the campaign trail reveal a different story. In reality, Lib Dem candidates and politicians have often dragged British politics into the political swamp with the shameful use of techniques that would not be out of place in the dirtiest of election campaigns in the United States. By directing a seachlight on to the unacceptable face of the Liberal Democrats we intend to make their brand of dirty politics itself an issue in the forthcoming general election, to make the party more self-conscious about their political practice. In part, the Lib Dems behave as they do because they perceive that questionable tactics such as character assassinations, false accusations, deliberate misrepresentations and misleading claims work. By taking a stand against these Lib Dem tactics, we aim to force Nick Clegg to clean up his party's act and focus instead on policy. This will be good for politics. Labour, Tory and other party candidates will then not need to spend so much time counter-attacking and rebutting Lib Dem accusations and will be free to participate in a more rational contest based on competing policies and visions of the future. For too long the Liberal Democrats have got away with presenting themselves on the national stage as a political force operating on a morally higher plane than their political opponents while, at the same time, using highly questionable campaigning tactics at the local level. With the aim of encouraging a higher quality political debate, NastyLibDems.org is a resource that will reveal to voters and the media the extent to which the Lib Dems engage in dirty tricks and negative campaigning.